This book demonstrates the need for contributions from medicine, sociology, economics, history and epidemiology. It also shows the necessity to consider health care at three key levels: individual patients and their experiences; health care organisations such as health centres and hospitals; and regional and national institutions such as governments and health insurance bodies. The book examines: inputs to health services, processes of care, outcomes, organization of services and improving the quality of health care. 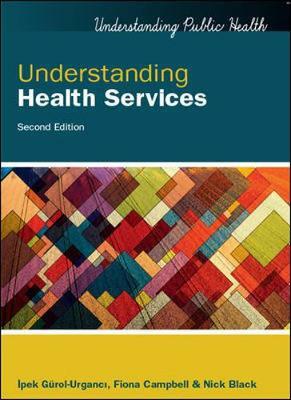 This text is aimed primarily at health professionals on Masters programmes in public health, health research, health promotion and similar courses. Nick Black is Professor of Health Services Research at the London School of Hygiene and Tropical Medicine, UK. Nick’s main current research interests are focused on the assessment of the quality of health care and the performance of health care providers. Lorelei Jones is a research fellow in the Department of Health Services Research and Policy at the London School of Hygiene and Tropical Medicine, UK. Lorelei’s research interests are in UK health policy and health service delivery and organization, particularly organizational sociology and the sociology of the professions. Ipek Gurol-Urganci is a lecturer in the Department of Health Services Research and Policy at the London School of Hygiene and Tropical Medicine, UK. Her research interests are in health system and service evaluations, particularly focusing on the performance and quality of primary care, women's health care and maternity services.